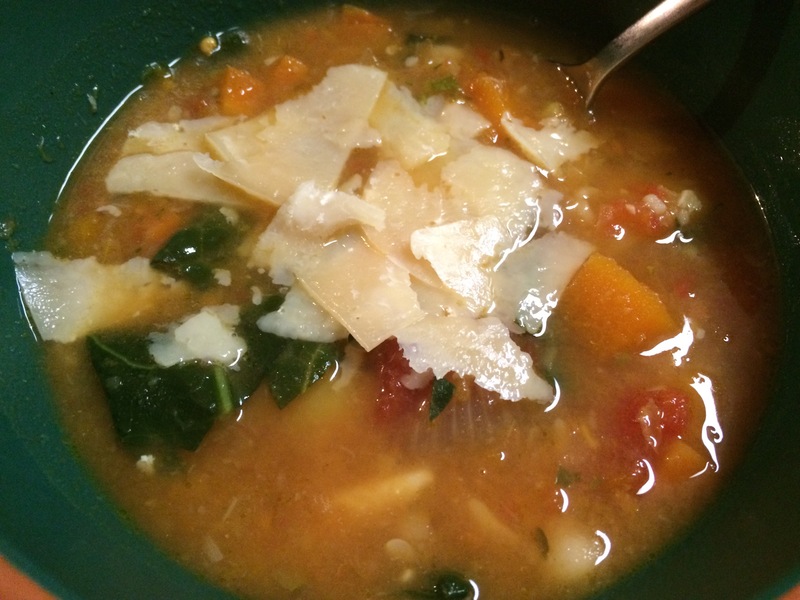 As we ate this and I was so surprised at how delicious it was, our daughter laughed and said, “What did you expect, of course it would be bad, you were making it. pause. 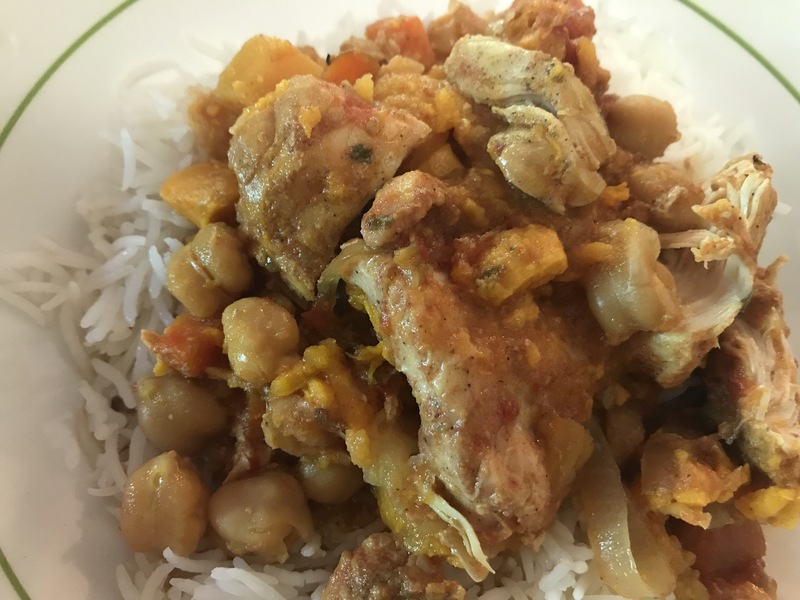 Of course it was going to be good!” Now, you have to realize how amazing this is – growing up the girls pretty much lived on Zatarains and dreaded when I would “cook.” They still tell war stories about some of the big failures. The change came really came about 8 years ago when I had a slow time with my business and dove into my garden and cooking for real. They started looking forward to coming home for dinner. They now tease my 7 year old that he never had to eat “bad” food (I even made just about all of his baby food). It was very reminiscent of a good meatloaf. Even the texture working with it felt like meat. And the glaze added a nice interest and even extra flavor to an already flavorful loaf. Prepare lentils by rinsing them and adding to a pot with water and a bay leaf. Bring the water to a boil, then reduce heat down and simmer covered until all the liquid is absorbed and lentils are tender (about 15-20 minutes). Remove from heat, discard the bay leaf and set the lentils aside to cool. This step can be done in advance (it helps with time management). In the meantime toast walnuts by spreading them onto a baking sheet and toasting in the oven for about 5 – 8 minutes. Remove from oven and let cool. In a medium pan, heat oil over medium heat. Cook onions, garlic, carrots and celery until they’ve softened and become fragrant. About 5-10 minutes. Set aside to cool. 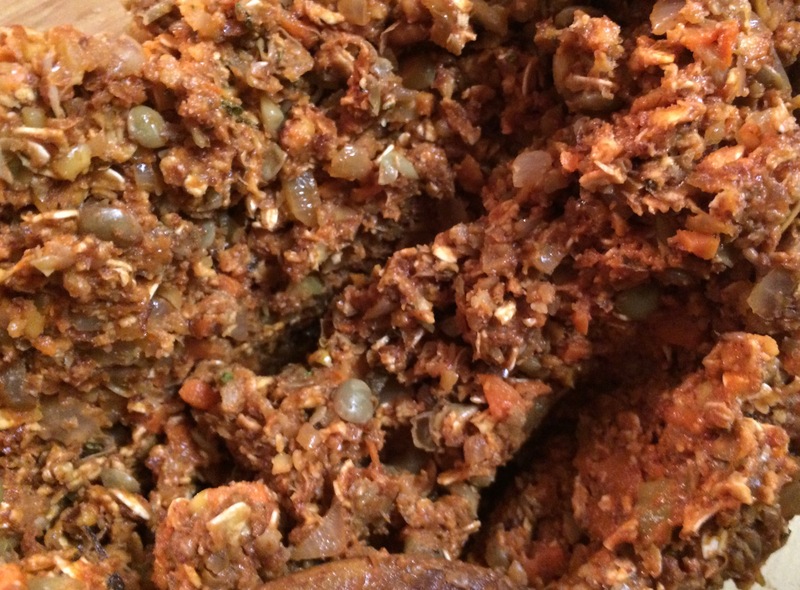 Add lentils (reserve ½ cup for later), cooked veggies, toasted walnuts, oats, soy sauce, tomato paste, ground flaxseed, maple syrup, apple cider vinegar, thyme, oregano, basil, cayenne pepper, ground pepper and sea salt to the food processor. Pulse until mixture is just combined and the texture is to your liking. You want the mixture to be combined enough to stick together, but you don’t want it to be completely pulverized. It should look and feel like ground beef texture. Press mixture into parchment lined loaf pan. In a small bowl stir together glaze ingredients. Spread the glaze over top of the loaf. Bake covered with foil for 25 minutes. Uncover and bake for about 8 more minutes. Let the loaf rest 15 minutes before cutting and serving. Enjoy! I am always surprised when I walk out to the garden. I expect to see the parsnips and Jerusalem artichokes that are not yet ready for harvest, not the but late season tomatoes we are still getting. They were perfect for a stew to serve to our vegetarian daughter when she came home to visit. 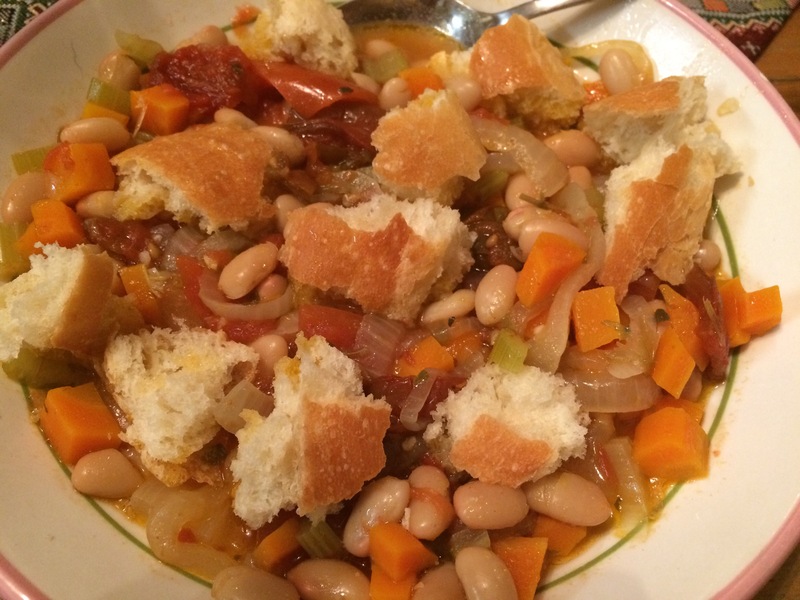 It had a nice delicate flavor and was perfect when you tossed some torn baguette into your bowl. Heat 4 Tbsp of the oil in a dutch oven over medium heat. Add the onion, carrots, celery, garlic, and the bay leaf. Cook, stirring often, until the vegetables are soft. Add the beans, parsley, oregano, tomatoes, honey, water, salt and pepper and stir to combine. Cover and simmer over low heat, stirring occasionally for 1/2 hour. Add the beans, stir and continue to cook for another 1/2 hour. Remove the bay leaf, stir in the remaining 2 Tbsp oil and the vinegar. Serve hot with a good bread. Enjoy! 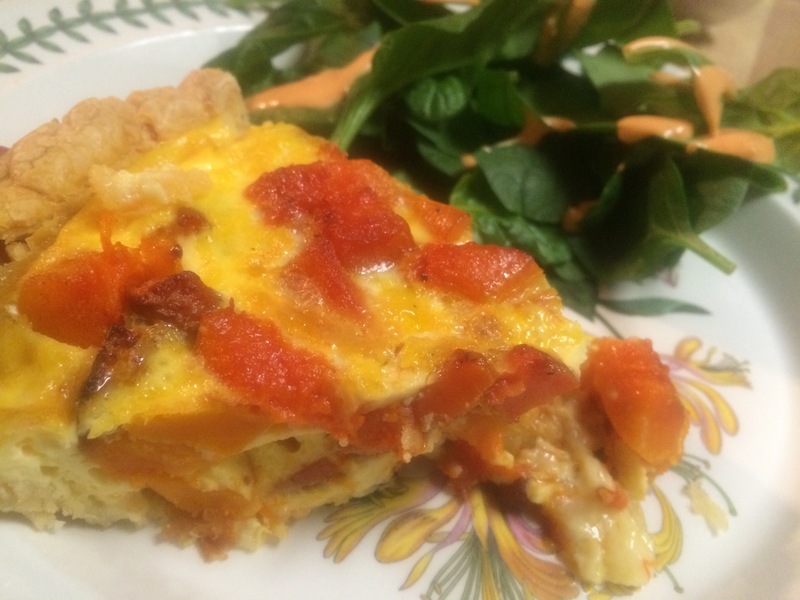 I won’t mince words, this is probably the tastiest quiche I have ever made. 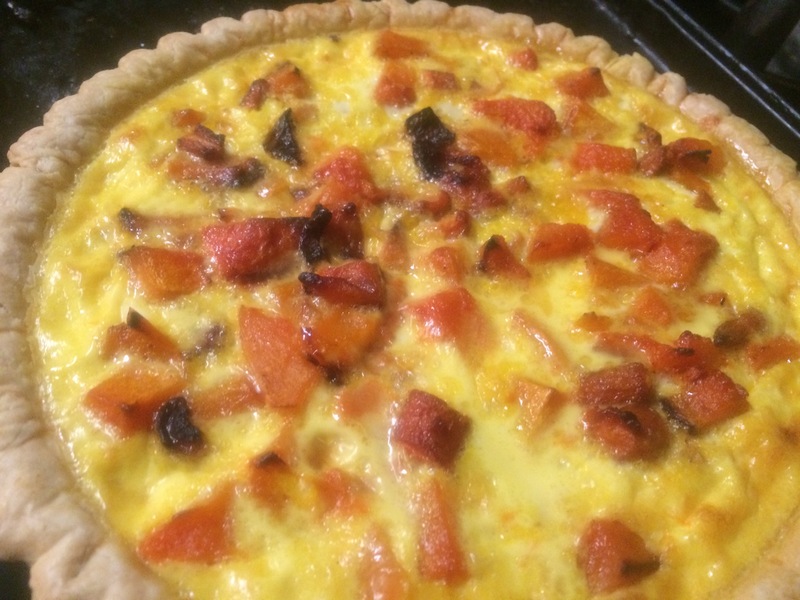 We learned the other day that roasted vegetables worked will in a strata, so I figured that butternut squash and some other roasted vegetables would work just as well in a quiche. I decided to keep with an orange theme and added an orange pepper and carrots. The other thing I learned with the strata was that extra sharp cheddar cheese goes well with roasted winter vegetables. So, in that went as well. I was lazy and used a frozen pie crust. I am trying to clean out my freezer, and there was a crust sitting in there waiting to be used. It was ok, but this would be even better with a home-made crust. 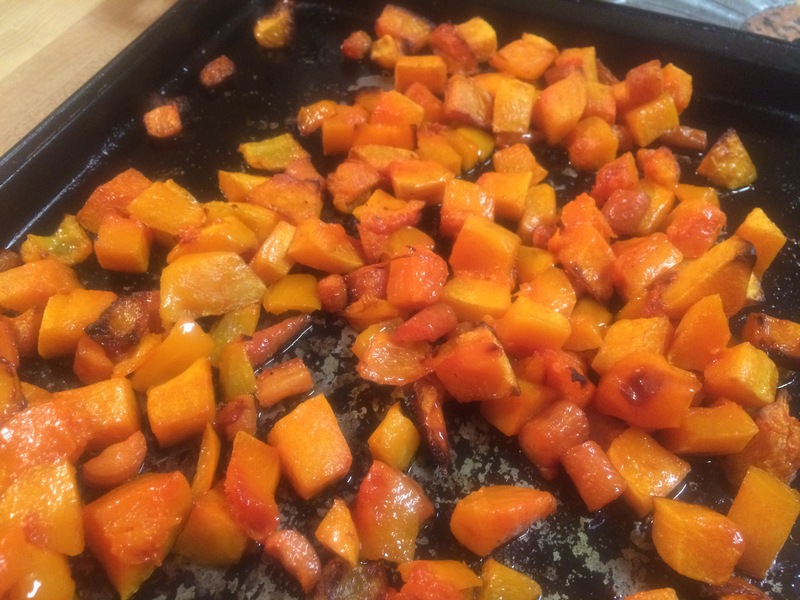 In a large bowl, toss the squash, pepper and carrots with the oil, salt and pepper. Spread on a baking sheet. Roast for 40 minutes, stirring after each 15 minutes. Remove from the oven and let cool. In a bowl, beat the eggs with the milk. Spread the cheese at the bottom of the pie crust. Place the vegetables on top of the cheese and spread out evenly. Pour the egg and milk mixture over the vegetables. Bake 40 – 45 minutes, till set. Let stand 10 minutes. Serve with a salad and enjoy! Two versions tonight – why? I roasted a lot of vegetables and my pastry crust was not big enough, so I also pulled out a pre-made pie crust and made a quiche. Each was worth making individually, so I have included both. Toss the vegetables with 1 Tbsp olive oil, salt and pepper. Lay on rimmed baking sheets in a single layer. Cook for 15 minutes, stir with lemon zest and thyme and return to the oven for another 15 minutes. For the tart, on a piece of parchment paper, roll the dough out into a, 1/8 inch rough circle. Transfer the paper onto a cookie sheet. 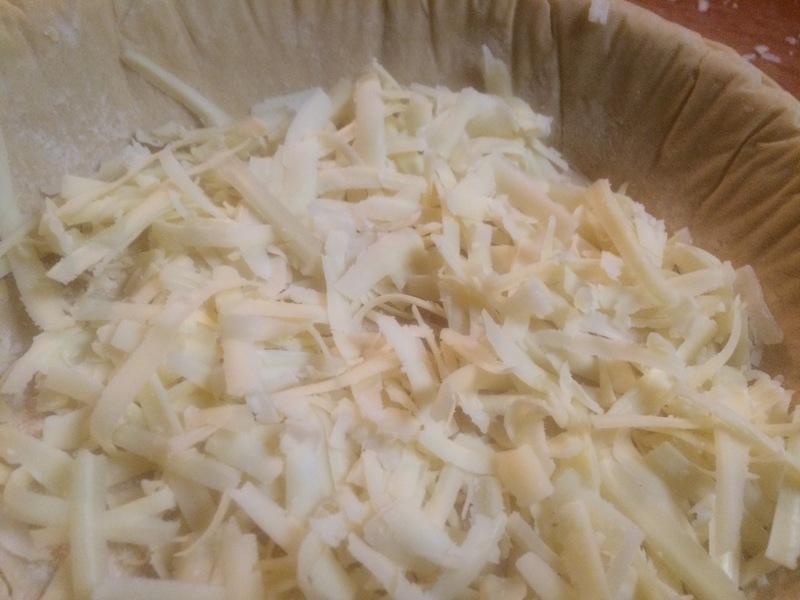 Sprinkle cheese in the center of the tart or the bottom of the pie crust. Spoon the vegetable mixture on top of the cheese, mounding it slightly in the center. Fold the edge of the dough over the edge of the filling creating pleats. Bake until the crust, including the pleats, is golden brown, 35 to 45 minutes. Transfer to a rack and let cool on the baking sheet for at least 10 minutes before serving. Spoon the vegetable mixture on top of the cheese. Beat the eggs with the milk. Pour over the vegetables. Bake for 35 – 45 minutes until the center is just set. Transfer to a rack and let cool 10 minutes before serving. I make these latkes when I am craving vegetables and still feeling the need to do the Hanukah olive oil ‘thing.’ I love them. The recipe comes from Smitten Kitchen, to make it more latke-like and less pancake-y I have reduced the eggs to 4. The original recipe calls for 6, I like that as well. I like making them large, so you eat 1 large plate-sized latke/pancake. And I love the okonomiyaki sauce! Yes, that’s boxed mac and cheese with the latke – the joys of having a 6 year old around. While I grow carrots and kale, my kale is all gone and my carrots are too small still. So, the main veggies are not local. Make the pancakes: Toss cabbage, carrot, kale, scallions and salt together in a large bowl. Toss mixture with flour so it coats all of the vegetables. Stir in the eggs. Heat a large heavy skillet on medium-high heat. Coat the bottom with oil and heat that too. To make a large pancake, add 1/4 of the vegetable mixture to the skillet, pressing it out into a 1/2 – to 3/4-inch pancake. Gently press the pancake down flat. Cook until the edges beging to brown, about 3 minutes. 30 seconds to 1 minute later, flip the pancake with a large spatula. Cook on the other side until the edges brown, and then again up to a minute more (you can peek to make sure the color is right underneath). Regardless of pancake size, you can keep them warm on a tray in the oven at 200 to 250 degrees until needed. Make the okonomiyaki sauce: Combine all sauce ingredients in a small saucepan and let simmer for 3 to 5 minutes, until smooth and thick. I thought I was done with innovative ways to make yummy potato latkes last year when I did the golden latkes with turmeric. But then I saw a little blurb in Food Network Magazine’s 50 cheese appetizers for pepper jack latkes. Ooh, that was intriguing. These vie with the spinach, potato and feta latkes for my all time favorite latkes. We enjoyed the spiciness the pepper jack added; if you want a milder version, use plain Monterrey jack cheese. 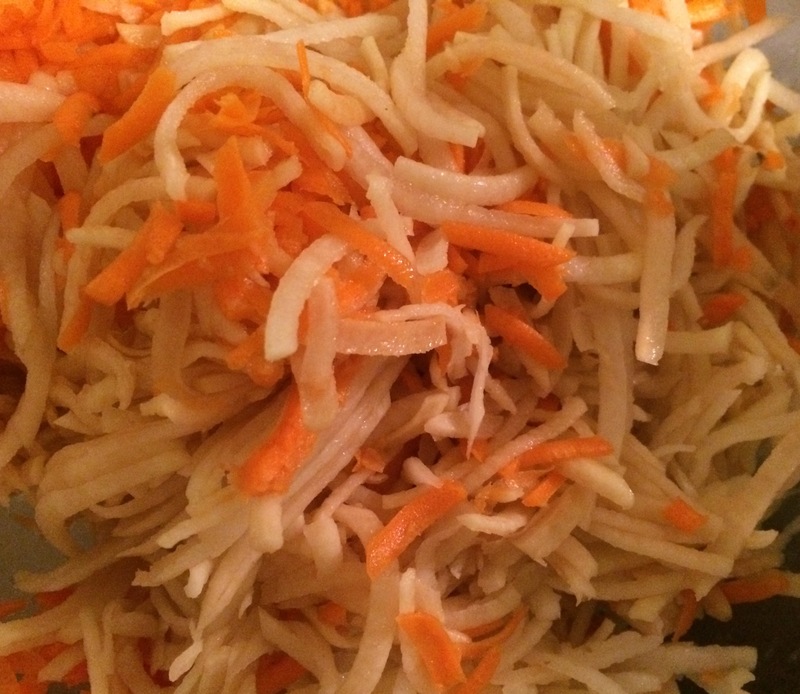 The grated carrots added a nice sweetness as well. These latkes make a hearty dinner paired with a nice salad. In this case it was an avocado caesar salad…yum. Peel and grate the potatoes and carrots. Squeeze dry. In a bowl, mix egg, onion, cheese, breadcrumbs, salt and pepper. 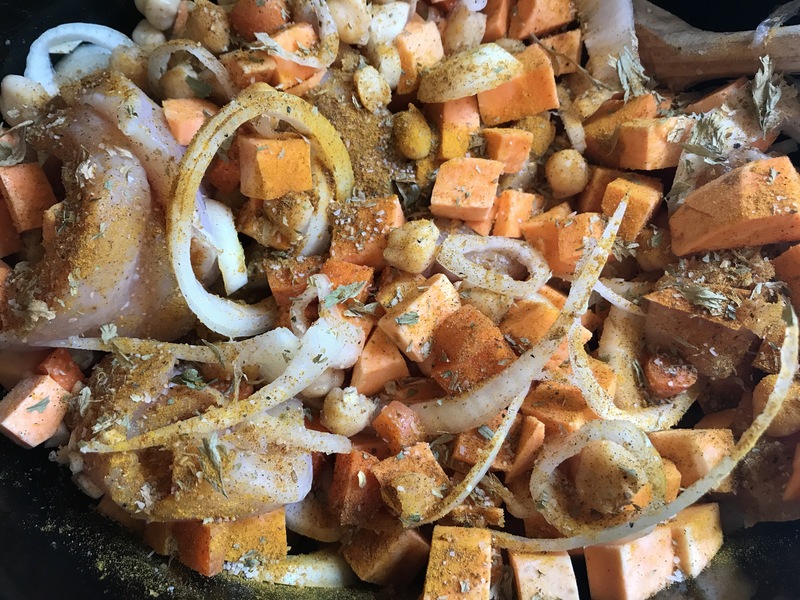 Mix in the potatoes and carrots. Heat 1/4 inch safflower oil in a cast iron or nonstick skillet over medium high heat. Form potato mixture into pancakes and cook in batches until golden, about 3 minutes per side. Serve with sour cream or plain yogurt. 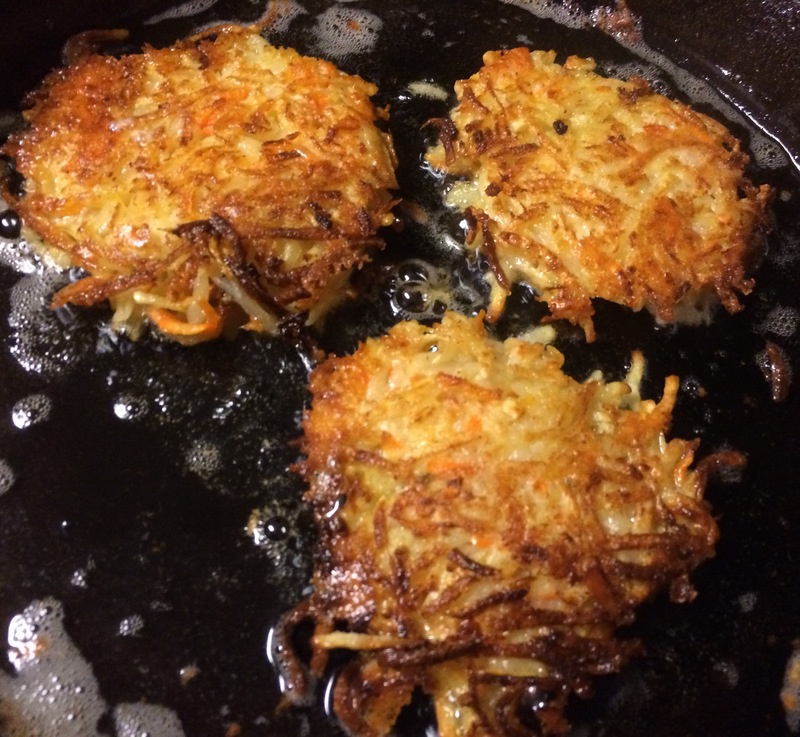 A latke recipe? in October? Really? Who says latkes are only for Hanukkah? Not me. Pan-fried patties made of vegetables are good any day, especially when the combination of the vegetables results in such a pretty color palette. As I have mentioned, the kale in my garden has escaped the jaws of the groundhog. Looking pretty, isn’t it? These latkes are really good. We dove into them so quickly, I actually have no photos of the final plated latkes. You can eat them with sour cream or other toppings, we had ours with Green Bean Polou (Persian Rice Pilaf), they went very well together. The flavors perfectly when combined in the same bite. I really wish I had a picture for you, but…next time. Heat the oven to 300 degrees. Line a sheet pan with parchment. Place a rack over another sheet pan.In a large bowl mix together the cabbage, kale, baking powder, salt, cumin, oat bran, flour, cornmeal and buckwheat flour. Taste and adjust salt. Add the eggs and mix together. Let the mixture sit for 5 – 10 minutes, then mix again. Heat a large heavy skillet (cast iron works well) over medium heat. Take a 1/4 cup measuring cup and fill about 3/4 full with the mixture. 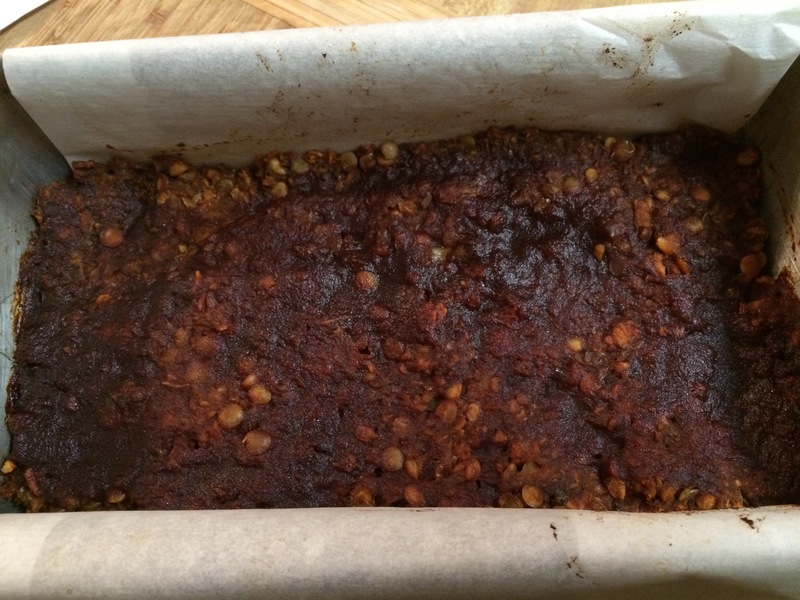 Reverse onto the parchment-lined baking sheet. Repeat with the remaining latke mix. You should have enough to make about 15 latkes. Add the oil to the pan and when it is hot, transfer a few latkes (probably 4 or 5 will fit) to the pan. Press down with the spatula to flatten. In my 10-inch pan I can cook four at a time without crowding; my 12-inch pan will accommodate four or five. Cook on one side until golden brown, about three to four minutes. Slide the spatula underneath and flip the latkes over. Cook on the other side until golden brown, another three minutes. Transfer to the rack set over a baking sheet and place in the oven to keep warm. I was not in the mood to fuss over dinner tonight. I didn’t even want to cook, but I had a lot of fresh veggies calling to me: broccoli and bok choy from my garden, asparagus from Filasky’s Produce, and sundry other veggies including carrots, celery, and onions. I decided on a stir fry, the next best thing to not cooking. What’s more, the colors always make me happy. I decided to try a different sauce combination (soy sauce, red wine vinegar, honey and tomato). Then my 6 year old came in, he wanted eggs, so the plan changed to accommodate all of us. Now I would make a very veggie fried rice. By the way…we really liked the new sauce. It gave the fried rice a great flavor. 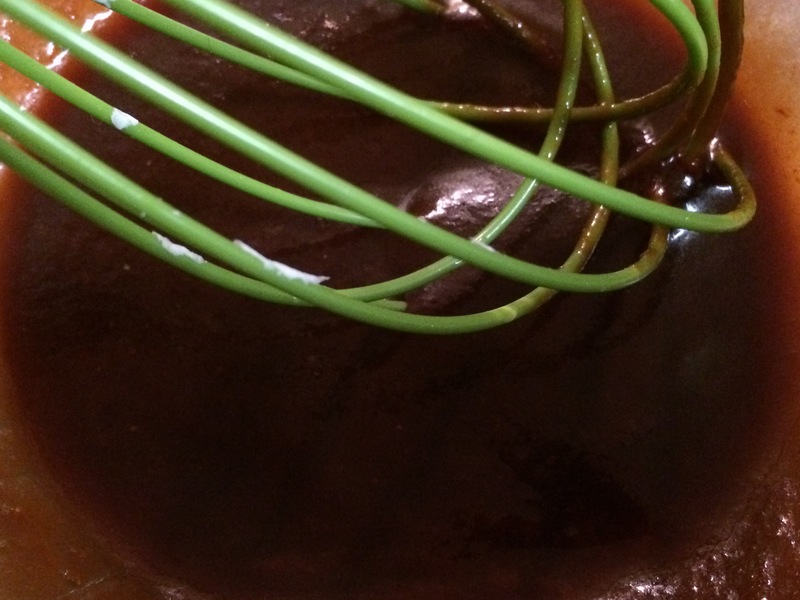 Mix together the soy sauce, red wine vinegar, honey and tomato. Taste and adjust if necessary. Set aside. Heat 1 Tbsp oil in a large skillet or wok over high heat. Add garlic and cook about 30 seconds, then add in the asparagus, broccoli, carrots, celery and onion. Stir fry for 3 – 4 minutes. Add bok choy, stir fry for 1 minute. Stir in sauce mixture and cook for 1 more minute. Remove to a bowl. Place the other Tbsp of oil in the pan and heat over medium high heat. Add the egg and stir until just cooked. Add the rice and stir fry for 2 – 3 minutes. Add the vegetables back in and stir until heated through.